Although the ripening of our Nerello Mascalese is a bit ahead of time this year, the white Malvasia and Moscadello grapes are slightly behind, as are also the other white varietals. 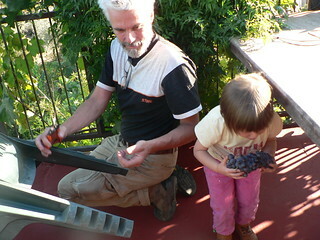 We will pick the biggest part for our rosato on Monday September 24th and so today me and Clara picked the first grapes to make our “pied-de-cuve” or starter from our smallest vineyard: our home terrace! The reason for making a “pied-de-cuve” is to start with the right yeasts as well as to avoid lots of oxygen on the must before it starts fermenting, avoiding oxidation at the early stage, before fermenting (a tricky period). Since 2007 I started making pied-de-cuves as I noticed in some batches, especially at the beginning of the fermentation, a distinct smell of acetone. And this phenomena was not an isolated situation in my cellar but was a problem in most serious cellars here on Etna and abroad. With lots of pump-over’s or oxygen exchange, this smell can be eliminated, although one is never sure. But evidently also part of the delicate aromas will disappear. Therefore I prefer to make these starters from the best clusters from the specific vineyard and ferment them in a neutral place, under the open sky, in order to avoid external influences of yeasts not related to vintage or bacteries infecting the delicate must. And our terrace is perfectly suited for this so that I can smell and give oxygen while moving the must and skins with the hands day and night. The interesting thing of mother nature is that beside all the good things, there are also all the bad things to balance the situation out… and so not all natural yeasts are good companions for wine to bring it to a good end. Just like in natural or sour dough bread, man or the artisan producer, needs to select the sour dough which is the most delicate. Just like in vinegar, the best ones are the gentlest. 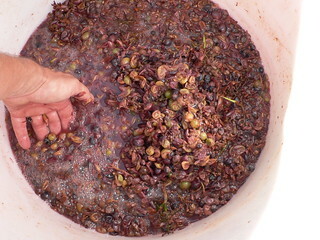 And with wine, this is the same: the best fermentations are the fruitiest. And for this to detect, one needs a good nose, attention and patience in the beginning of the fermentation. We averagely throw away 2 to 3 times a starter before we have the right one which will serve to initiate the fermentation in the cellar. This entry was posted on Thursday, September 20th, 2012 at 10:43 pm	and is filed under Work in Progress. You can follow any responses to this entry through the RSS 2.0 feed. Both comments and pings are currently closed.